Writing is a lonely endeavor. In the solitude of the craft, it’s easy to lose touch not only with the bigger picture of your own work, but with the larger industry, creative communities, and readers that surround you. Although this is a struggle all writers face, it’s one that Orthodox ones must be particularly vigilant about. Why? For at least two reasons. First, there are relatively few of us compared to other categories of writers, just as there are demographically fewer Orthodox Christians compared to other religious groups (in North America, at least). This means we are spread out in time and space in ways other writers may not be, requiring greater effort to develop a shared sense of mission, craft, and industry. Second, the arena of English-language Orthodox content production is in its adolescence. While many other Christian groups have been at this throughout the twentieth century, we haven’t. That means that (in some genres and media formats more than others) we’re still figuring out what it means to be Orthodox writers. On a deeper level, we’re still figuring out how writers can best serve the Church or help the Church speak redemptively to the broader culture. Many of these questions came to the forefront of my mind while writing my recent book, published by Ancient Faith Publishing. While completing the manuscript, I struggled with basic writerly questions like who is my audience? What are the genre characteristics my readers will expect to find in a book? There was no handbook or industry guide I could consult to get a better handle on these and other questions. And although I consulted with other Orthodox writers, their personal insights were just that: personal insights. Not a bird’s eye view of my genre or the larger industry and ecclesiastical context of Orthodox writing. I have gradually realized this is a big conversation, one with lots of facets depending on genre. It’s also a conversation that needs to be hashed out formally and informally, not just among writers and publishers but within the Church at large. In any case, it’s only been a few days since the survey’s been out in the world, and already I’ve been surprised by some of the results. In general, I’m finding far more diversity on what I would consider central questions than what I expected when I crafted the survey. So far, I haven’t detected a strong correlation between individuals in either of these two camps and their primary audiences or genres. In other words, it’s not apparent that those who write for primarily Orthodox audiences tend to have a more spiritual view of writing than those who write for “secular” or non-Orthodox audiences (although the survey is in its early stages and more insight on this could emerge depending on subsequent responses). What, if any, are the reasons for and implications of these differences? 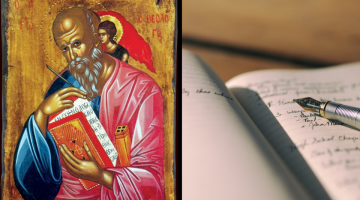 Which leads to the crux of the whole survey: What does it mean to be an Orthodox Writer? Does it require writing for a strictly Orthodox audience about “Orthodox topics”? If you are Orthodox and just happen to be a writer—in your job as a business person, for example, or as a freelancer—are you an Orthodox writer? Or do you have to be producing content in an explicitly Orthodox ministry or industry? Here, too, there is more variety than not. Some describe their writing simply as something they do—to pay the bills, as a job expectation, etc. In this category, there are a contingency of folks who do not seem to consider themselves Orthodox writers. Others described a missional purpose behind their labor as writers; even if they do not write for Orthodox audiences or even about religious themes, they nonetheless consider themselves Orthodox writers. Moving from theory to practice, the high point of the survey for me were the suggestions participants offered on how to better support writers. What types of resources and services could help move our craft, genres, ministries, and publishing venues forward? I’m already excited about the creative thoughts that have been proposed and will definitely write more about this in future. On a timely note, however, numerous folks specified that there should be more conferences for Orthodox writers. If that’s something on your heart, too, check out the annual Ancient Faith Writing and Podcasting Conference (this year: June 20-23 2018). Personally, this event has greatly strengthened my writing (and soul!) in previous years and has allowed me to forge priceless connections with other “Orthodox writers,” broadly defined. I wish more people, and my anonymous survey respondents, knew about it! So, what does it mean to you to be an Orthodox writer? I’d love your input! Moving forward, after the survey closes on May 10, 2018, I’ll be continuing my research via interviews. I plan on using whatever information emerges to develop resources for other writers, as well as make my research available to others who may also want to do the same. If you’d like to receive the results of the survey or future resources that may emerge, sign up here for updates. Dr. Nicole Roccas has been researching and writing about time from both a historical and theological perspective for nearly ten years. In addition to being a writer and editor, she lectures at the Orthodox School of Theology at Trinity College (Toronto). You can find more of her writing on her Ancient Faith podcast and blog, Time Eternal, and her website, www.nicoleroccas.com. Nicole has a PhD in History from the University of Cincinnati. A native of Wisconsin, Nicole lives in Toronto with her husband, Basil, whose efforts to indoctrinate her into the ways of maple syrup and Canadian spelling have yet to take effect.